surdu_petru on xda-developers.com has just released a brand new rooted custom firmware for the Archos Gen9. 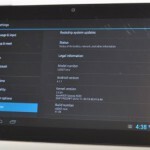 It brings Google Face Unlock, root access and many optimizations to the Gen9 tablets. The installation is mainly targeted for developers and experienced users, it requires Archos Special Developer Edition firmware (SDE) to be installed on your tablet. removed almost all applications you can download for free from PlayStore ! enabled I/O -> fast /data as in stock firmware 4.0.24 ! build kernel from Archos source code with my Optimized Toolchains GCC 4.4.7 ! go to recovery SDE and Remove Android kernel if you have already installed any official firmware ! go to Flash kernel & Initramfs and copy here zImage and initramfs.cpio.lzo -> in the new driver that appeared ! Ok ! … & wait to boot ! After complete installation, please restart the device again ! In the second boot, ( and only the second boot ) bootanimation may run slightly slowed !